Silverweed is a perennial plant that is edible and has a multitude of health benefits. This plant is a member of the rose family and grows in many countries. There were changes to botanical names therefore silverweed can be properly identified by either of its Latin names (Potentilla or Argentina anserina). Interestingly, when a person has excessively sweaty feet, placing a leaf or two in each shoe is a natural way to help absorb moisture (due to the starch content). 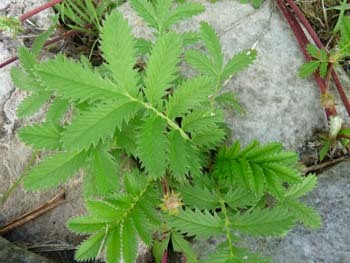 Silverweed is an analgesic, anti-spasmodic, astringent, diuretic and a tonic. Distinguishing Features: This unique plant is recognized by the leaves that can have up to twenty leaflets with smaller ones mixed in with larger ones. Silverweed has (red-coloured) runners that have the ability to root at the nodes and they are sparsely covered in long white hairs. Flowers: The silverweed flower is yellow, measures up to 2 centimetres in diametre and has five petals. 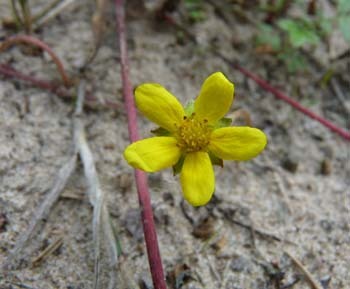 (There are some flowers reported to have six petals.) The flower grows on a leafless stalk and blooms between June and September. Silverweed flowers are insect pollinated as well as self-pollinated as they are hermaphrodite. Fields of Nutrition has medicinal benefits and vitamin/mineral content of Silverweed. 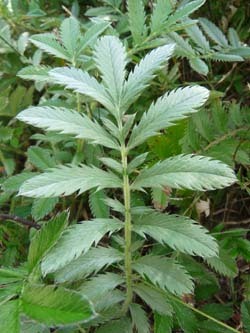 Leaves: Silverweed leaves are compound, with many oblong, toothed leaflets. Leaves can be green or silver on the top surface and silver below, leaflets are hairy to wooly on the top and densely wooly below. Leaves are pinnate and have up to twenty leaflets. Some leaves have measured up to 18 centimetres long although the average leaf size is about10 cm. Height: This plant can grow to about 30cm in height, although it is best recognized more as a runner. Habitat: This plant grows well in many areas throughout North America, Europe, Australia, New Zealand, Asia, South America and in parts of Africa. 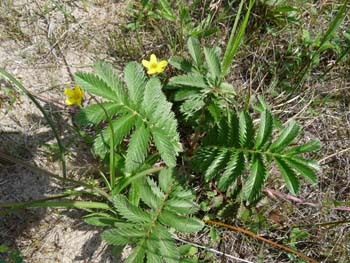 Although silverweed can grow in arid, grassy areas, it is also found in meadows and by wet sandy shores. Depending on location, this edible plant has also been found in ditches as well as in moist calcareous (chalky) soils. Edible parts: All parts of the silverweed are edible and are a good source of flavonoids. Leaves can be made into an herbal tea or tossed into a salad, stew or a stir fry. The roots (best collected in autumn) can be used raw or cooked. Some people have dried the root and powdered it to use in a variety of culinary dishes as it is a natural use for added starch. It is said to have a pleasant nutty taste.